The San Lian Bookstore in Hong Kong, in an undated photo. The ruling Chinese Communist Party says one thing and does another when it comes to Hong Kong, often acting in ways that are inconsistent with the city's promised freedom to govern its own affairs, according to a recent policy report issued by the State Department in Washington. Repeated comments from Chinese officials asserting the supremacy of the Chinese constitution last year served to "dilute" the concept of a "high degree of autonomy" enshrined in the 1984 Sino-British handover treaty and the city's mini-constitution, the Basic Law, the report said. "While [Beijing] publicly and frequently reiterated its commitment to the 'one country, two systems' framework ... other statements and actions ... were inconsistent with its stated commitment to Hong Kong’s high degree of autonomy," the report found. For example, China's National People's Congress Standing Committee has required the city to legislate to make "disrespect" of China's flag or national anthem a criminal offense. Beijing also announced it would apply mainland Chinese law at a high-speed rail terminal checkpoint within Hong Kong's separate jurisdiction, the report said. The State Department also cited the refusal of entry to U.K. Conservative Party human rights campaigner Benedict Rogers by Hong Kong immigration officials last October, citing U.K officials as saying that it had been carried out at Beijing's instigation. The report also criticized Beijing for issuing a preemptive interpretation in the row of the validity of oaths of allegiance sworn by newly elected members of the city's Legislative Council. "As a result of the interpretation, Hong Kong courts disqualified six pan-democratic legislators elected in 2016 for improper oath-taking; two still have appeals pending," it said. The report came as a survey found that Beijing's Central Liaison Office in Hong Kong controls more than half the city's publishing industry, with ownership of three major bookstore chains and more than 30 publishing houses in the city. Sino United Publishing, which was acquired by the Central Liaison Office in 2015, controls more than 80 percent of book sales via its three chains: Joint Publishing, Chung Hwa Book Co. and the Commercial Press. But the Radio Television Hong Kong (RTHK) survey found that the office also owns or controls more than half of the publishing industry via stakes in more than 30 publishing houses in the city. Lee Cho-jat, who was the first chairman of Sino, told the station that the group is "a national asset" and the Liaison Office is obliged by Beijing to coordinate "different units." RTHK's current affairs program "Hong Kong Connection" traced the ownership of Sino United through two holding companies in Hong Kong and Guangzhou, across the internal border in mainland China. The Guangzhou company has only one shareholder: Beijing's Central Liaison Office, the show reported. 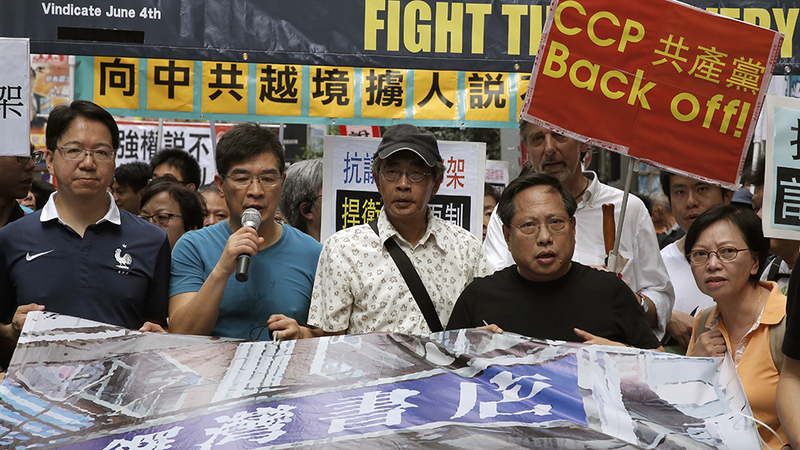 While Lee denied any political agenda, Lam Wing-kei, one of five Hong Kong booksellers held in cross-border detentions in 2015 for selling "banned books" to customers in mainland China, dismissed such claims. "Clearly this is a form of ideological control," Lam said. "Books that are considered politically sensitive or inappropriate will be completely banned." Lam said the China-owned chains had been loathe to promote books touching on the 2014 Occupy Central movement in Hong Kong. "They would take delivery of them, and put them in a cupboard, and they would only bring them out if a customer asked for them," Lam said. "[In some cases] they will actually put out a directive stopping the branches from selling books at all, for example, books that promote localism or autonomy for Hong Kong; they have been totally banned, you can be sure of that," he said. Democratic Party chairman Wu Chi-wai said he has detected a distinct shift in Beijing's approach to Hong Kong. "Their takeover of Joint Publishing, and their willingness to speak out it, in such an open manner clearly demonstrates that the central government doesn't even care about crossing certain lines when it comes to respecting the one country, two systems [framework] now," Wu told RFA. "They used to exert control via communist-backed capital in a much more underground manner; they never laid all of their cards on the table like this before." Hong Kong chief executive Carrie Lam told reporters that it was "difficult to comment" on the RTHK program. "The Central Liaison Office needs to buy property, or do other things, in Hong Kong as part of its operations and its work requirements," she said. "As long as it is legal, we don't get involved in what they should or shouldn't be doing." Asked if the practice undermined the "one country, two systems" arrangement, and whether Beijing's liaison office interferes in Hong Kong affairs, Lam declined to respond. Hong Kong's bookstores, which once drew Chinese bibliophiles from far and wide in pursuit of some of the city's most off-beat, salacious and politically radical writings, are being squeezed out by rising retail rents and growing influence from Beijing. One such store, Causeway Bay Books, made world headlines in 2015 when five of its staff members went missing in the course of two or three months. Swedish national Gui Minhai, who headed the Mighty Current publishing house that owned Causeway Bay Books, "disappeared" under murky circumstances from his holiday home in Pattaya, Thailand on October 2015, only to reappear in China "confessing" on video to a decade-old alleged drunk-driving offense. He now faces further charges of spying after being snatched from a train as he traveled to Beijing in the company of Swedish diplomats. In the months that followed, store manager and British national Lee Bo, 65, went missing from his workplace in Hong Kong, and the group's general manager Lui Bo (also spelled Lui Por) and colleagues Cheung Chi-ping and Lam Wing-kei were also all detained, later to resurface in China, accused of selling "banned books" to customers across the internal border in mainland China. Beijing's interest in Hong Kong's publishing industry appears to have been sparked by the city's 2014 pro-democracy movement for fully democratic elections, sparking concerns about the "gradual spread of ideas promoting Hong Kong independence" since the Occupy Central movement brought hundreds of thousands of people onto the streets at its height. Chinese officials blamed the "illegal occupation" on a lack of patriotic education among the city's young people and renewed calls for Beijing-backed programs of patriotic education in Hong Kong's schools. It's clear Beijing has no respect for HK autonomy or democracy. They are violating their 1997 agreements. In 1951, the CCP promised Tibet a high degree of autonomy too. But that ended after the 1959 Tibetan uprising & Beijing imposed direct rule and completely disenfranchised the Tibetan people from local affairs. And that's the status of Tibet today, a mere colony of the PRC.